In the summer of 2009 I was lucky enough to move to Germany to begin working as a pupil for Anja Beran. Originally I had planned to stay for one year but ended up staying for 18 months. During this time I had at least one lesson a day with Anja either on my own horse or on one of hers, I also trained with her more experienced staff. Anja is incredibly dedicated to the art of classical riding and aims to help preserve this with her work. She has a yard of around 50 horses of various breeds, ages and personalities! Many of the horses that come to Anja’s yard are brought there because they have “problems”, either physical or mental. Many, but not all, of these issues were sadly caused by incorrect training elsewhere. Anja and her team work with all of the horses in their care according to their own physical needs and limitations. During my time with Anja I was able to observe and in some cases help with the rehabilitation of these horses. Some of the luckier horses in Anja’s stable were sent there to be started by owners who wanted to give their horses the best start in life, watching and helping with this was another very interesting aspect of being a working pupil. I first met Anna Jantscher while we were both training under Anja Beran in Bavaria. While I stayed for 18 months, Anna spent almost five years training with Anja. Already a talented rider before she arrived Anna learnt a great deal in her time with Anja riding up to twelve horses a day, horses that could not have been more diverse: a well-schooled Friesian with oblique pelvic position, complete novices, problem horses as well as fully trained dressage horses – the full range! It was also one of her everyday tasks to pass on to pupils the skills she had acquired. 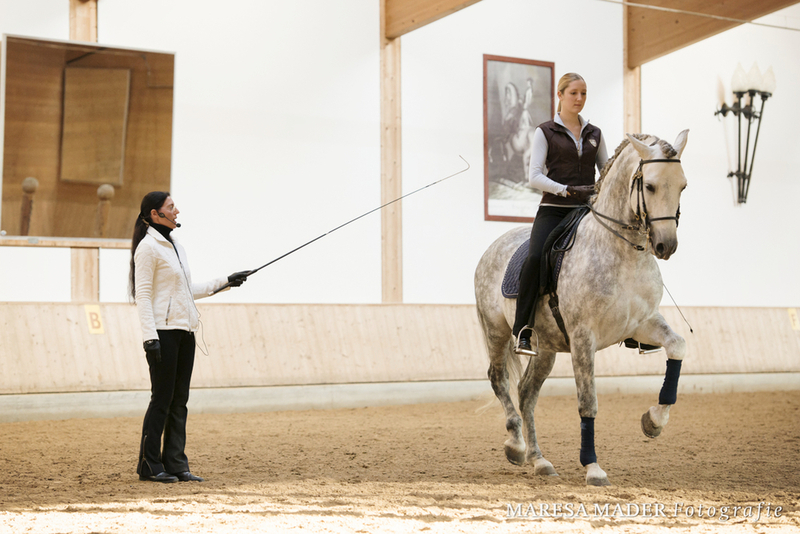 During her time with Anja, Anna presented horses at clinics, morning work sessions, in-house seminars and the annual seminar at the Circus Krone winter quarters in Munich. Anna also had the unique opportunity to present horses for various media publications. Some of her highlights were a photo on the cover of the 2012 September edition of “Cavallo” and pictures and recordings in the “Classical Dressage with Anja Beran” book and DVD. Anna now runs her own training yard in Bavaria where she has up to 20 horses in for starting or schooling at any one time. She also teaches clinics all over the world including here in the UK where we are lucky enough to have her come over 4 times a year. She will soon be moving to Eastern Germany as she has bought an equestrian property with her partner from which she will continue to train horses and riders. Not one to stop learning Anna now trains with Marc De Broissia on a regular basis. Taking her horses over to him or being taught on his own horses.